In quest for the program’s first ever NCAA National Title, Jeff Walz and the Cards are still dancing. That path would lead them to a 2013 tournament rematch with the Tennessee Volunteers in the second round. The Vols have won 8 national titles in program history. 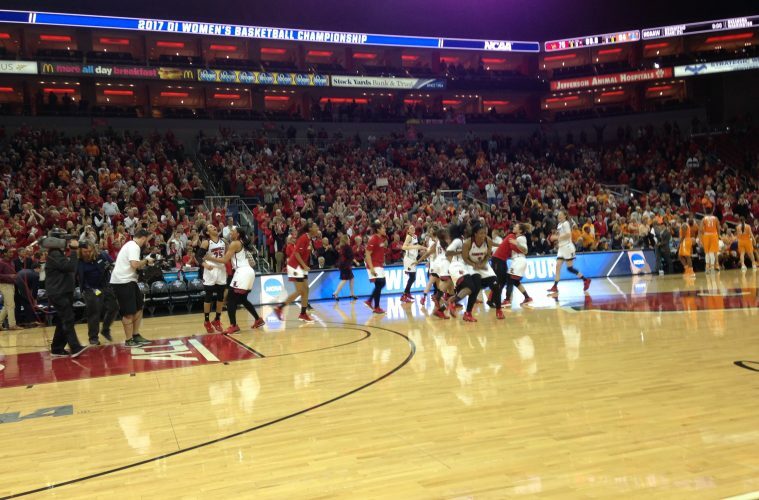 Louisville defeated Tennessee 75-64 Monday night to advance to the second weekend and round of 16 in Oklahoma City. It was off to the races for both teams. In the first quarter the Cards and the Volunteers shot 56.3 percent from the field.. Louisville had 3 threes, Tennessee had 2. Excitement and anticipation for the match was obvious. And it was some good basketball. Louisville couldn’t make it out of the first weekend in their 2016 campaign, Tennessee had never lost a second round game prior to this meeting. It was Mariya Moore who commanded the show for Louisville. She played all 40 minutes and went 7-10 from the field, 5-5 from behind the arc. She finished with 19 points, 9 rebounds and 4 assists. Asia Durr couldn’t quite get the 3s to fall, going 1-8 on the evening but found other ways to contribute.. she finished with 23 points, 6 rebounds and 4 steals. Myisha Hines- Allen only finished with a double-double, her 17th of the season.. 14 points 13 rebounds and 5 assists. Q. How important was it to kind of break through this level and get to the Sweet 16 and for these young players to experience what they’re about to experience? COACH WALZ: I think it was an important step for especially Mariya, Myisha. Myisha said it perfect, her freshman year we get to the Sweet 16, but like I always told Mariya and Myisha, all they had to do was score. All they had to worry about was scoring. Now they’ve got to do a little bit of all. I was really proud of them. I mean, Myisha, and I’ll show her on film, this was probably one of the best games she’s played since she’s been here because she stayed engaged. She missed some shots, she didn’t make things, but she kept rebounding, kept defending. Normally she’ll check out on me for three or four minutes, and she did not do that tonight. That’s her next step in the evolution of her game. Louisville shot its first pair of free throws with :48 seconds left in the first quarter and didn’t shoot another until there was 6:20 left in regulation. Tennessee had 9 more points on 11 more attempts than Louisville. 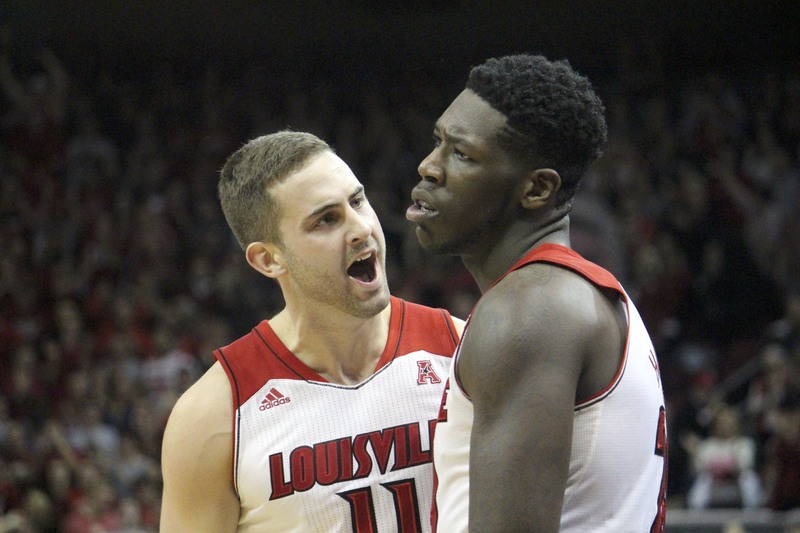 The Cards, however, held the advantage in points in the paint, 36-20. Which is outstanding with 6-6 redshirt junior, Mercedes Russell, down there to defend for the Vols. Russell had a double-double 11 points and 13 rebounds. Named by coaches to the All-SEC First team for the 2017 regular season, Tennessee’s leading scorer Diamond DeShields went 3-12 on the day, didn’t make a 3 on 3 attempts.. she finished with 15 points, 3 rebounds and 1 assist. After committing her 2nd personal foul with 9:15 left in the 2nd quarter, she did not return until the second half. Tennessee had 3 players play all 40 minutes; Nared, Russell, Reynolds. Q. Tennessee has never lost a second‐round game. I think the number is 28‐0 coming in. So what’s that say about not only the level of competition, but the accomplishment of beating them? MARIYA MOORE: Well, this is the first time we’re hearing of that. Regardless if they had lost or hadn’t lost, we just came to play our game. It’s a huge accomplishment. All these second‐round games have been very competitive, so we weren’t expecting ours to be any different. But I’m happy our team was able to pull through. MYISHA HINES‐ALLEN: Like she said, it’s the first time we’ve heard of that, so thanks. But it’s March Madness anything can happen. They came and played their best game of basketball, and we also did. So, I mean, two great teams just going at it, anything can happen. We’re lucky enough to get the win in front of our fans because last year we were unable to accomplish that goal. But just knowing this year we were able to do it in front of an amazing crowd. The crowd was loud. When we were down, they were still with us, even when we were up, they were still with us. I mean, just the fact that we were able to get this win not only for ourselves and for our confidence going into our next game, but for our fans as well. Louisville had the lead for 31 minutes of this one, Tennessee, 6 minutes. But the fourth quarter really made all the difference in this one where Louisville shot 64.3 percent. Durr went 3-3 from FG range and made 6 of 8 free throw attempts. Hines- Allen had 7 points, 5 rebounds and 2 assists in the fourth quarter. With a big smile on her face to go with it..
Q. Myisha, it seemed every time you had the ball in your hands in the fourth quarter, you had a smile on your face, whether you were taking the rebound or ripping the lay‐up. Were you aware of how close you were to clinching? MYISHA HINES-ALLEN: Yeah, every rebound I pulled down, I was just like, we’re one step closer. That was just a mindset. If you get the stop, you’re one step closer to getting to the Sweet 16. We get a stop, we’re one step closer. So every time I was able to get up there and get a rebound, because they’re great rebounders, they’re top in the country in rebounds, so every time I was able to get one in the fourth quarter, it was just like, yeah, we’re one step closer. Get the ball up to one of our guards, and let’s go work on the offensive side. It’s just like one step closer to this. That’s my whole mindset going in to the fourth quarter. The Cards are headed for the SWEET 16 for the 7th time in program history. Where: Chesapeake Energy Arena, Oklahoma City, Okla.
Recap: After beating their first round opponent, Texas Southern by 89 points and their second round opponent, the California Bears 86-46… Louisville is set to meet Baylor for another 2013 tournament rematch.